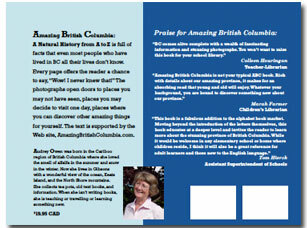 On this page: Information for bookstore owners and others who want the technical information about Amazing British Columbia: A Natural History From A to Z and links to information about how the book was written, and how you can buy your own copy. 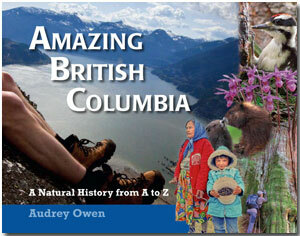 Summary:This natural history alphabet book about British Columbia is written at a Grade Three level and includes facts intended to make even people who grew up in BC say, "Wow! I never knew that!" An ideal intergenerational book for residents of BC, it is also a wonderful souvenir to send to friends and family who live elsewhere or for tourists to carry home in their luggage. Back cover as sent to the printer. The printed cover has both ISBN and UPC bar codes. See pages from the inside of the book.